I often loose my way in dreaming and stupid behaviour. One of the things that help me to find my way again are the lyrics of pop songs. Of course, these songs are about the relation between two people, but they can easily be listened to as about the relation between a human being and Life. Sometimes the song is told from the perspective from the person, sometimes (and that are the most interesting ones) from the perspective of Life itself. Life is what you make it. I cannot expect others to be what i am not myself. If I want Life to be paradise, I have to start living according to the way I imagine paradise is. Paradise is a private affair. Just like hell, by the way. I forget all this many times a day. But there is always something there to remind me, and most often it are pop songs. 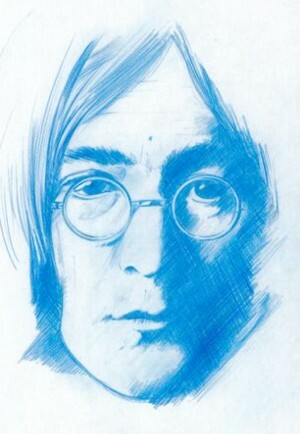 One of the most inspiring songs that speak from an un-personal viewpoint, is for me Imagine by John Lennon. It is as if a loving, wise grandmother is talking to her teenage grandson, who is not understanding how Life works. In stead of telling him what she knows, she asks him to imagine the best life he can. Which IS how life works, of course. A few years ago I was deep into the strange world of data reduction. I will tell you the full story later, but one of the (many) questions on which I could not find an answer, is at which bit rate two different mp3’s are no longer distinctable. I named this the mp3 vanishing point. An average 128kbs mp3 is about 3mb, which means that it is a string of 3.000.000 zero’s and one’s. For the radio program that I did back then, and I asked John Koenmans if he could make me an mp3 of Imagine in the lowest recognisable bit rate. As always, John came up with something better: he made a montage of Imagine with slowly decreasing bit rates. It starts with 224kbs and then every few seconds the bit rate drops with 12kbs, ending with 8kbs. That means that one can almost read the zero’s and one’s in the same speed that your mp3 player makes them audible. The version you get to hear here is an mp3 of the WAV version that I got from John Koenmans, so the bit rate is even lower than 8 kbs in the end. But as you can verify, it is still clearly recognisable as Imagine . Let’s say it ends with 1kbs. Then what you hear is only 1000 zero’s and one’s per second. That is about the length of the text that you are reading right now! I still don’t know what the mp3 vanishing point is. And I wonder if it exists at all. Imagine that all the songs ever made can be decoded as zero’s and one’s in such a way that you only need 1000 bits to hear them as recognisable different songs… I find this, eh, hard to imagine.